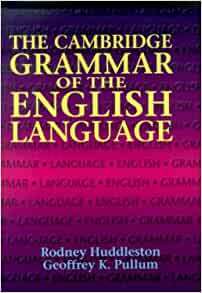 This book presents a new and comprehensive descriptive grammar of English, written by the principal authors in collaboration with an international research team of a dozen linguists in five countries. It represents a major advance over previous grammars by virtue of drawing systematically on the linguistic research carried out on English during the last forty years. It incorporates insights from the theoretical literature but presents them in a way that is accessible to readers without formal training in linguistics. It is based on a sounder and more consistent descriptive framework than previous large-scale grammars, and includes much more explanation of grammatical terms and concepts, together with justification for the ways in which the analysis differs from traditional grammar. The book contains twenty chapters and a guide to further reading. Its usefulness is enhanced by diagrams of sentence structure, cross-references between sections, a comprehensive index, and user-friendly design and typography throughout. This is not a grammar text for the faint of heart. I keep mine at the office as a research reference next to my copy of the Longman Grammar by Biber et al. In addition to being a handy improvised murder weapon, this text serves as a grammar reference for linguists. While not exclusively "for us by us," one has to consider the perspectives involved, and descriptive linguists are very much at the helm. Strunk & White would turn over in their respective graves. I'd recommend it for any graduate students who enjoy passing the time arguing over increased specificity of negation or the scope of ellipsis. In all seriousness, this is the grammar reference book I'd recommend. Not everyone needs a $200+ grammar reference book. For those who do (or at least believe that they do), This text is it. Huddleston and Pullum include whatever approaches necessary to get the job done, though they lean towards the theoretical. One needn't be a grammar expert to use this text, though being familiar with the metalanguage would be helpful in negotiating this comprehensive (read: huge) text. Excellent Book. The first eight chapters span nouns, adjectives, adverbs, propositions, and a couple chapters about sentence structure - complements and adjuncts and other syntax. The book is wonderful, for example, in the preposition chapters or the adjective chapters, he compares these parts of speech with other parts of speech. It really helps ensure you fully understand by that method alone. Who would compare a preposition to an adverbs? And break it down in detail what is similar and what is different? It's a wonderfully approachable book. Perfect Hull of the Ship for a Self-Study of a Classical Education. And to improve reading comprehension and probably promotes clear thinking. I'm an accountant. This is part of my goals for improving my analytical skills. It's beyond that though. It's probably the cornerstone of a good education I missed when I branched right into the Business School. If this is important topic for you, you'll appreciate having this book! Exhaustive, comprehensive and will answer almost every question you have about the English language. Every thing you ever wanted to know about English and a whole lot more you would prefer to have never heard about.